In previous DRC’s political crises, international and African actors have at some times been a moderating influence, and at others enabled further escalation. What role are they playing this time? Signing on December 31, 2016, of a political agreement by signatories of the October 18 Political Agreement and the Rassemblement-led opposition. Photo MONUSCO/John Bompengo. This article is the fifth in a series that analyzes the ongoing challenges to the democratic process in the Democratic Republic of the Congo and how various actors and institutions will shape the outcome. December 19, 2016, should have been Joseph Kabila’s last day in office as president of the Democratic Republic of the Congo in the country’s first democratic transfer of power since independence in 1960. The next day, after he refused to step down, at least 34 protestors were killed by security forces. On December 26, civilians were killed in a massacre in the restive North Kivu province in the east, raising fears that the crisis could lead to further deterioration of the security situation. External engagement in the chaotic, violent, and fraud-ridden 2011 elections was minimal. … The current crisis is a legacy of the 2011 process. The actions of African and international actors will be central in keeping the parties to their commitments under the new deal. Past experience has shown that timely and coordinated external engagement has been a moderating influence that has laid the groundwork for negotiated outcomes. Uncoordinated or detached international involvement, in contrast, has enabled further escalation. This lesson is all the more vital, given the inherent difficulty in implementing peace agreements in an environment of deep suspicion among the parties. The DRC’s multi-party democratic elections in 2006—the first since the authoritarian regime of Mobutu Sese Seko—marked the high point of foreign engagement in the country’s affairs. South Africa, as mediator of the Inter-Congolese Dialogue that ushered in a democratic transition after two devastating civil wars, led a robust African effort to create a conducive electoral climate, including lending its electoral equipment to the Congolese election management body. The Southern African Development Community (SADC), African Union (AU), European Union (EU), and United Nations (UN) worked in a coordinated fashion to support the process. Key interventions included managing the technical and logistical aspects of the balloting, providing security at polling stations, and mediating election disputes. By contrast, external engagement in the chaotic, violent, and fraud-ridden 2011 elections was minimal. According to Congolese scholar Mvemba Dizolele, this “hands-off” and “ad-hoc” approach was driven by a narrow focus on stability and security at the expense of a more sophisticated and long-term focus on stability achieved through inclusive politics as required by Congolese law and by various AU instruments such as its Charter on Democracy, Elections, and Governance. The current crisis is a legacy of the 2011 process. In the process, Joseph Kabila’s legitimacy was badly weakened, political consensus has dissipated, and opponents have fled into exile. SADC’s leverage in the DRC comes from several decades of security engagement and regional diplomacy. It twice intervened in a stabilizing role. The first was in 1998, when it invoked collective security by authorizing intervention by Angola, Namibia, and Zimbabwe to beat back a Rwandan and Ugandan invasion that had reached Kinshasa. The second was in 2003 when SADC left a residual force to guarantee the country’s defense and build the DRC’s security sector after the war. In keeping with this commitment, SADC in 2013 deployed the Force Intervention Brigade, consisting of troops from Malawi, South Africa, and Tanzania, to neutralize the M23 rebels in eastern DRC. SADC’s effectiveness will depend on whether its efforts are employed even-handedly, and in ways that tie SADC’s strong security interest in stability with an inclusive democratic process. The SADC Organ for Politics Defense and Security (SADC Troika), the body that oversees Southern African security issues, leads SADC’s engagement in the DRC. On June 28, 2016, the heads of state of its current members—Angola, Botswana, Mozambique, Swaziland, South Africa, Tanzania, and Zimbabwe—met to discuss the region’s security situation. This was followed by crisis talks on the DRC in early October, and then the deployment of a ministerial team to accelerate voter registration and reinforce AU mediation. But these efforts did not bear fruit. On October 18, the AU brokered a deal on a transitional government and a new timeline for elections in 2018, but it did not include the main opposition coalition, le Rassemblement. The Catholic Church pulled out of the talks, citing the exclusion of le Rassemblement and to protest the government’s violent crackdown on political activists in September that left 50 people dead. SADC was criticized for welcoming this partial agreement, a move many say undermined it as an institution that enjoyed a reputation as an impartial and highly influential actor dating back to its stewardship of the Inter-Congolese Dialogue. African Union facilitator Edem Kodjo. Photo: MONUSCO/Theophane Kinda. 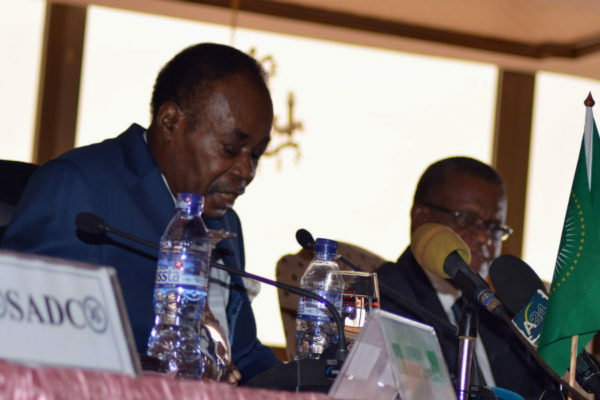 At the DRC’s request, the AU, in January 2016, dispatched ex-Togolese Prime Minister Edem Kodjo to mediate the crisis, with the backing of SADC and the International Conference on the Great Lakes Region (IGCLR). The EU deployed a support team to work with Kodjo, as did the international body, la Francophonie. The AU and IGCLR joined SADC in endorsing the deal reached in October that excluded most of the opposition, while the EU released a statement criticizing the process. The rift among key African and international actors has undermined efforts to present a united front necessary for an inclusive settlement. Ultimately, the endorsement by the AU, SADC, and IGCLR secured regional backing for Kabila, thus giving him no incentive to abide by the Constitution’s term limits and step down. The mandate of the UN’s peacekeeping mission, MONUSCO, was renewed until March 2017 to protect civilians and create an environment conducive to elections. The mission is providing technical and logistical support in revising the voter registry and supporting African and international efforts. On the diplomatic side, UN Special Representatives Maman Sambo Sidikou and Said Djinnit are coordinating multilateral efforts. All this is taking place in an environment of growing mistrust. The DRC government had pushed to halve MONUSCO’s 20,000-strong force, saying it opposed outside forces influencing its electoral calendar. This also put into question the future of ongoing joint operations by UN and Congolese forces in the volatile eastern DRC and further blunted the effectiveness of a coordinated international response. 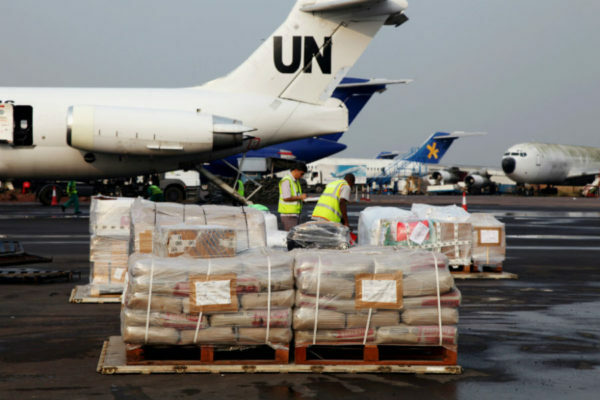 UN supplies in the DRC. Photo: MONUSCO/Myriam Asmani. In October 2016, the EU froze the assets and restricted the travel of seven senior Congolese security officials for obstructing efforts to find a political solution and serious human rights violations. Its conflict resolution effort is led by its special representative for the Great Lakes region, Koen Vervaeke, in close coordination with special envoys from the United States and Belgium. Such efforts could build on the EU’s capabilities and influence as a major development and security partner of the DRC. The EU also has a history of multilateral engagement and trust with the African Union and SADC. The significant moral suasion and political influence of the Catholic Church in the DRC was essential to getting Kabila and the leading opposition groups to the table and will be key to holding them to the agreement. Given this unique position of leverage, concerted African and international support for the Church’s efforts might create opportunities for a breakthrough. The lessons of African and international engagement in the 2006 elections show that the unity of these efforts can help deliver a democratic outcome. This can only be replicated if the AU, SADC, IGCLR, UN, and EU work as a team with one voice in engaging the parties. SADC’s role is critical, given its institutional memory, leverage with the Congolese government, and lead role on the DRC. Tanzania, as chair of the SADC Troika, and Angola, in its capacity as chair of ICGLR, can both invigorate coordinated support for the expanded mediation by the Church. However, SADC’s effectiveness will depend on whether its efforts are employed even-handedly, and in ways that tie SADC’s strong security interest in stability with an inclusive democratic process. The lessons of African and international engagement in the 2006 elections show that the unity of these efforts can help deliver a democratic outcome. This can only be replicated if the AU, SADC, IGCLR, UN, and EU work as a team with one voice in engaging the parties. The role of regional and international actors in mitigating regional conflagration will also be vital given the record of crises spilling over borders in the region. In 2013, the AU negotiated a security compact between the DRC and its neighbors including commitments against introducing hostile forces or supporting proxies in the DRC. This compact should be invoked as the Congolese continue to navigate the current political crisis. Mvemba Phezo Dizolele and Pascal Kalume Kambale, “The DRC’s Crumbling Legitimacy,” Journal of Democracy, Volume 23, No. 3, July 2012.